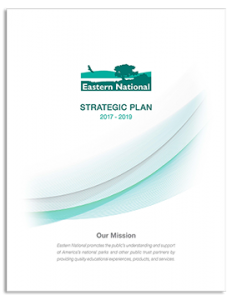 With guidance from our board and a strategic planning firm, Eastern National introduced a strategic plan initiative in early 2016. Dedicated to ensuring a strong operational base while increasing support for our partners, the plan features a single Central Strategic Challenge that will guide us throughout 2019: Strengthen Eastern National’s foundation to accelerate mission delivery and growth. Additionally, four Strategic Priorities were identified as key areas of focus for Eastern National: partnerships, people, operations, and finances. In 2017, we will begin implementation, including the development of work plans that will drive each goal to completion. Foundation strengthening activities, such as the development of new capabilities, will continue throughout 2018 with the expectation that we will begin seeing returns in 2019 as we implement new tools and procedures that will ultimately accelerate mission delivery and growth. To view our Strategic Plan, click here or on the image below.